It’s official. I have just found my DREAM house. (Well… at least one of them). As you probably know by now, I love my old homes and renovations. I love the rustic textures and character details; the bits of history; that worn, lived-in feel. I had always sworn I would NEVER build or buy a new house. Renovating appealed. Not building from scratch. Well, in one morning I have completely changed my mind after seeing a new house so wonderful, warm, quirky and full of character and history, it actually made me want to build! 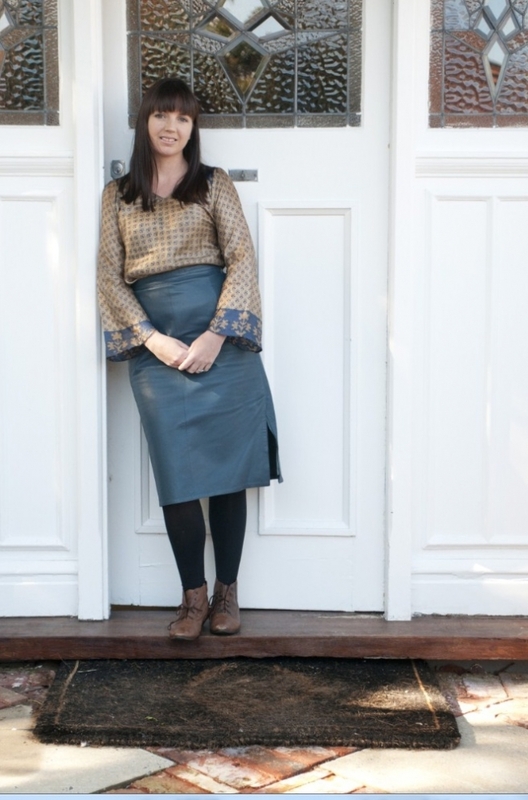 And if we were to do so, I think THIS is the woman I would ask to design and build it for me – home owner Carla Karsakis of building design studio Etica Studio. 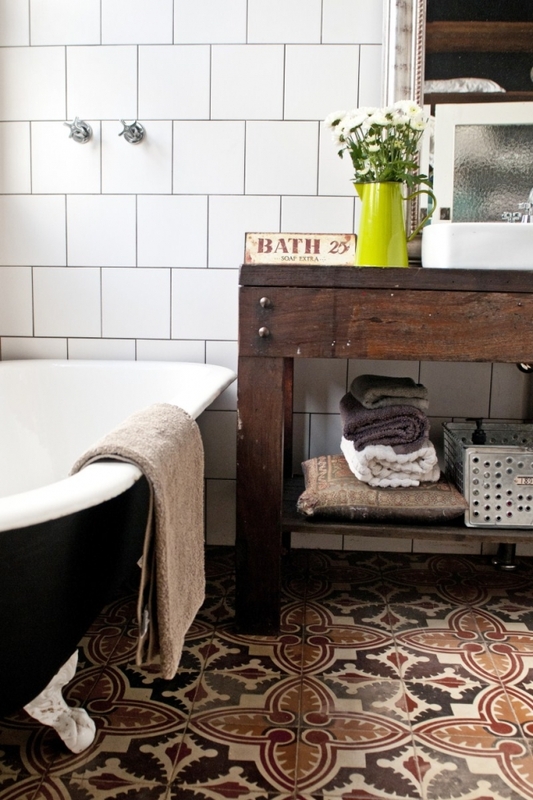 Bathroom perfection - antique floor tiles from Spain. 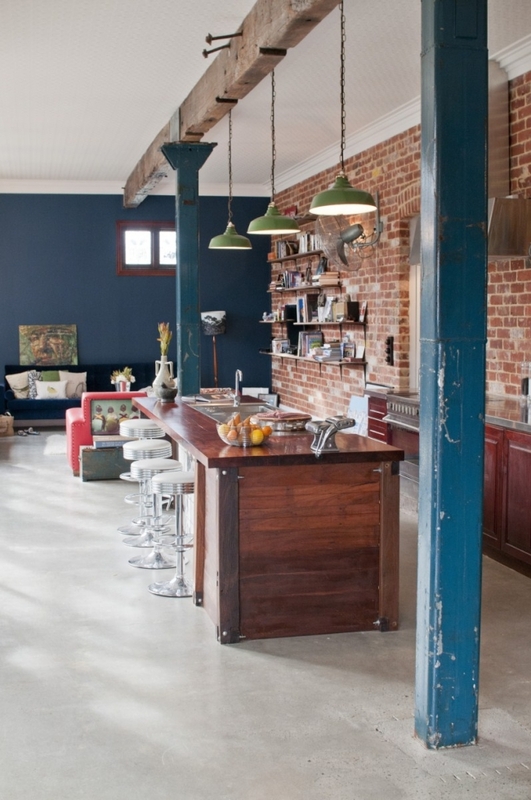 High ceilings give the home a greater sense of space. "The spatial layout flows really well and the sense of volume achieved in a relatively compact home is very successful," says Carla. Styling and photography: Meghan Plowman. 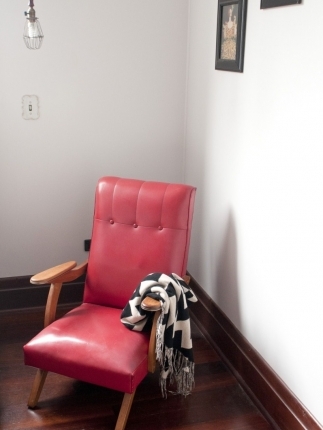 WARM AND INVITING: "My style as a building designer is sustainable, eclectic, creative and warm," says Carla. "When designing a home I consider elements of sustainability in terms of size, orientation, thermal properties and materiality, but always with a vision towards creating interesting interior spaces that have personality and aren’t too “architectural” and cold. 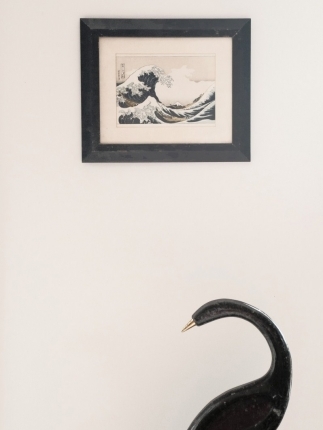 I like to incorporate vintage, antique or recycled elements to add character to spaces, whilst minimising the overall embodied energy of the renovation or construction." 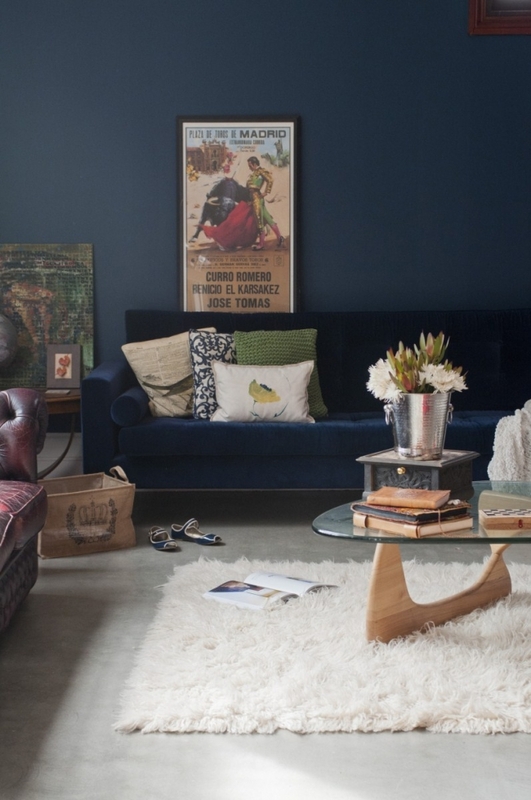 Carla and Ben had the navy velvet couch custom-made locally for them by Ambassador de Buenos Aires. The hessian bag was from Gingerhouse Homewares, who have a pop-up store at 183 Rokeby Road, Subiaco. Styling and photography: Meghan Plowman. 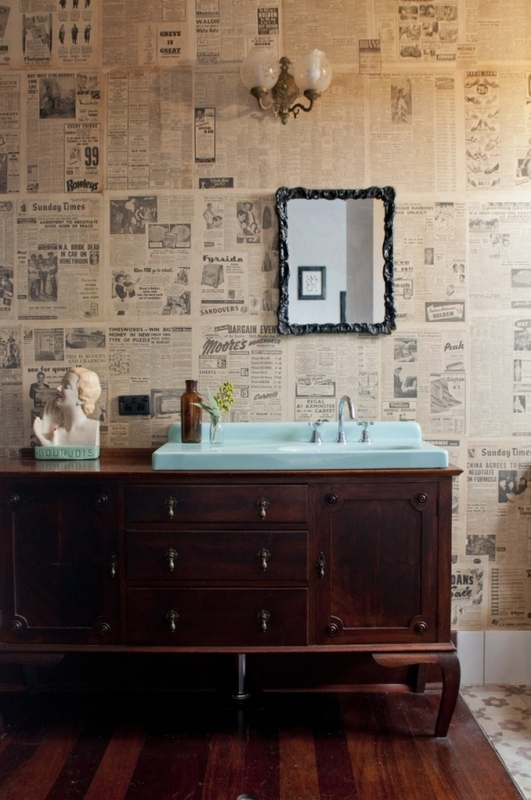 UPCYCLED WALLPAPER: “Whilst renovating the front house, prior to this build, we found hundreds of 1955 newspaper sheets under the linoleum,” says Carla. “We salvaged these and used them for paper flowers at our wedding and most recently as wallpaper in our dresser/ensuite. It is stunning and the soft brown colour of the sheets adds real warmth to the room.” I love this. Styling and photography: Meghan Plowman. Styling and photography: Meghan Plowman. SHELVING BEAUTY: At the inception of the project, Carla found these beautiful blue rusted cast iron brackets at a salvage yard. They were purchased for a few dollars and sat in the shed waiting until the home was finished to be mounted. Styling and photography: Meghan Plowman. I’m very excited to share this home with you because it is one of my favourites ever, and luckily done justice with professional styling and photography by the insanely talented Meghan Plowman of The Orchard rather than my crappy snaps. Owner Carla Karsakis and her husband Ben designed this place to be their own home as well as a showcase for Carla’s budding business. When I first saw photos, I presumed their home was an old converted shop. As I found out when I went to Bedford to see it, the entire place was actually built just last year. What I love about it is that almost every single bit of it is made from recycled and salvaged materials. And it is wonderful. “This house references our love for Art Deco shopfronts and warehouse apartments, and the desire and interest for sustainable living a short skip to the city!” says Carla. ABOVE: Home owner and very talented Etica Studio designer Carla Karsakis. Photography: Meghan Plowman. 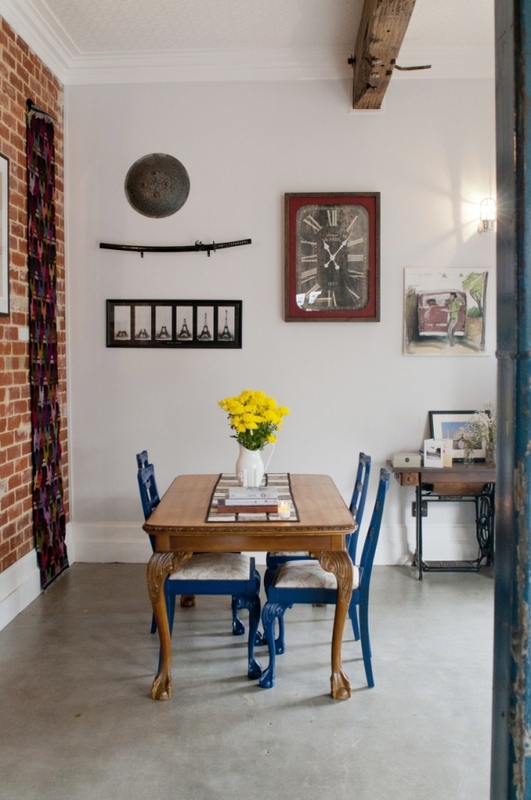 EXPOSED BRICK: I think I will love beautiful, old, recycled brick forever. 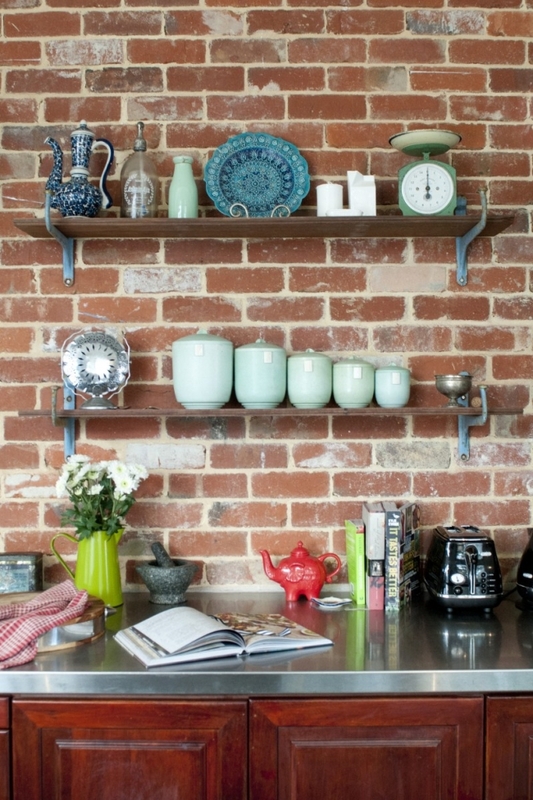 “A major feature of the home and the kitchen is the recycled brick wall, acting as an internal spine which performs structurally, thermally and aesthetically; referencing the beauty of rustic warehouse living,” says Carla. The rich red colour adds a sense of warmth to the interior and provides a backdrop to the kitchen, which is the central gathering space to the living area. Carla painted the old chairs for a pop of colour. Styling and photography: Meghan Plowman. 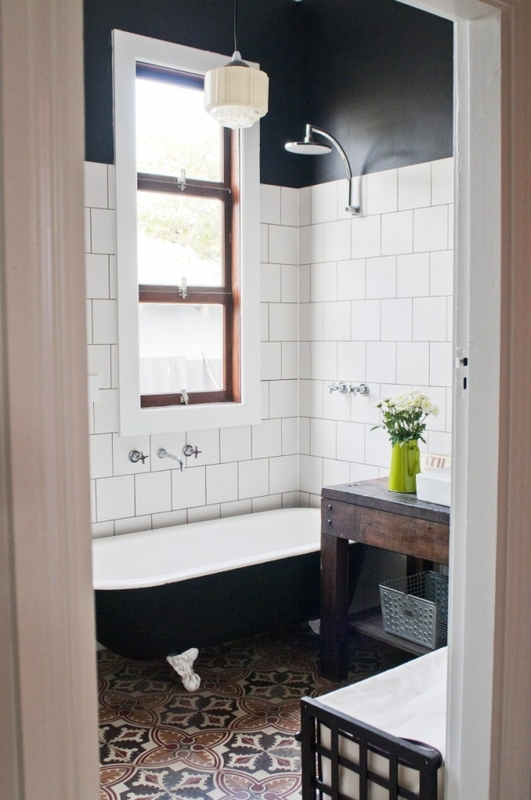 TILE STYLE: The main bathroom has a recycled window and door, an old clawfoot tub, a vanity made from the old workbench that was in the shed – and those tiles! 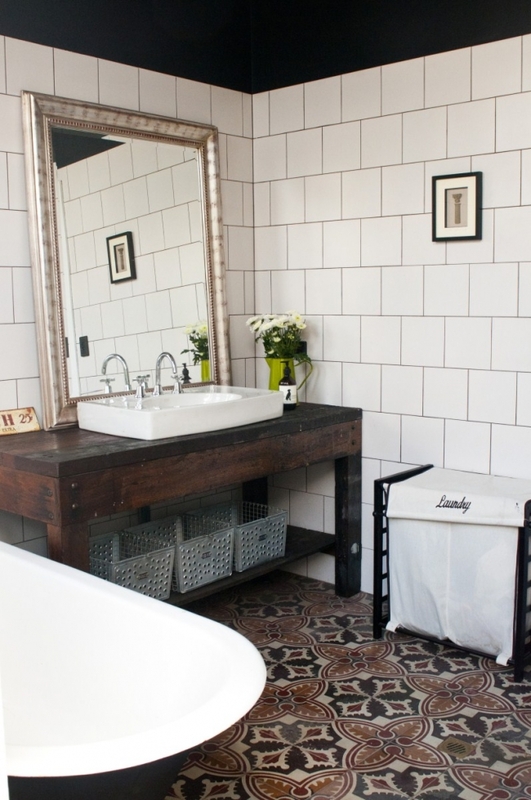 “As a small splurge we imported some antique Spanish floor tiles direct from Spain for our bathroom,” says Carla. “We took a risk here and the outcome is divine. 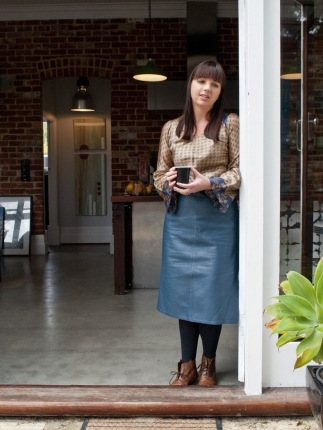 The vase was from Gingerhouse Homewares, who have a pop-up store at 183 Rokeby Road, Subiaco. 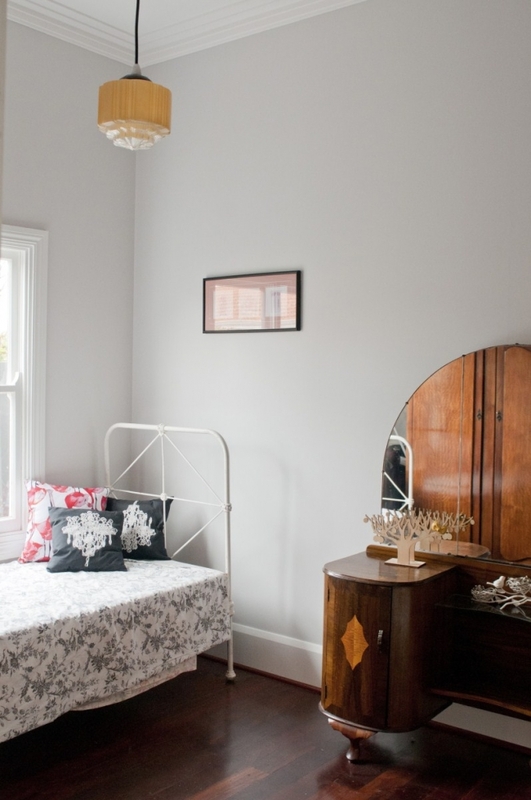 Styling and photography: Megan Plowman. Carla and Ben had originally bought the block which came with an Art Deco cottage in front. They renovated it and subdivided the large block with the aim of building this place – Etica Studio – at the back. To do so, they demolished the old, dark garage and shed in the back garden (thought to have been built in the 30s or 40s). Carla, who has a passion for sustainable architecture, designed the new house to be environmentally friendly and they built heaps of the new house with remnants from the old outbuildings, with walls of recycled red brick and sustainaible Paneco SIPS. Every single feature I point out, there’s history behind it. It made it such a fun house to tour! 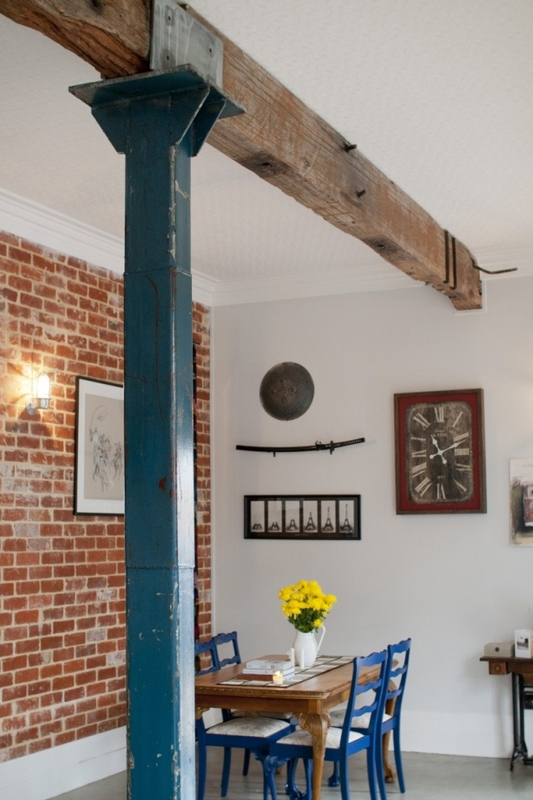 The huge recycled ceiling beams were originally a part of the Toodyay Bridge. The window in the powder room was from Steve’s pub in Nedlands (a place I loved on Wednesday nights when I was 18). The front door was from an old house in Shenton Park. The light switches in the bedroom are Victorian and more than a hundred years old. (“The electrician wasn’t too happy about them!” laughs Carla). WELL-PLANNED: I have always been amazed by people who build from recycled materials and odds and ends – just how do they get everything to fit just so? Carla explains –PLAN! “Six months prior to our decision to build, we had designed a schematic layout for the home, but as we wanted to incorporate predominantly recycled elements, our first port of call for the new build was to buy all the doors and windows and design the home around these. 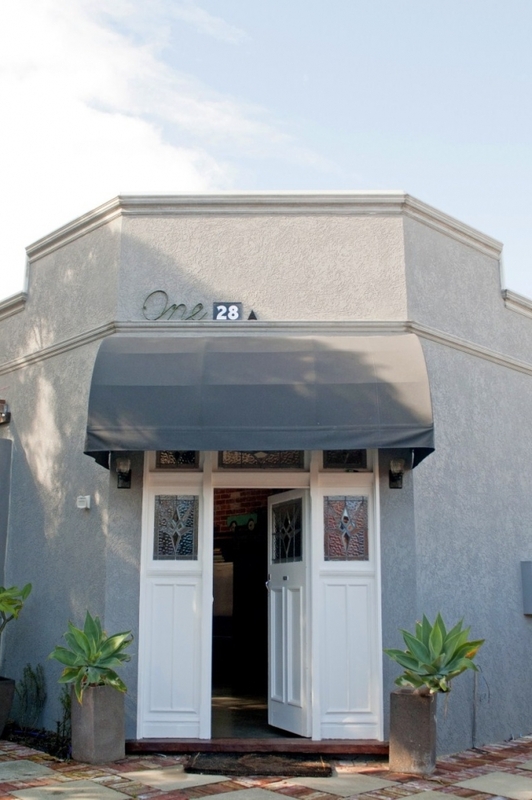 We purchased all doors and windows from two salvage yards in Bayswater, Vinsan and Statewide Demolition.” Then they build and adjust the home around these features. “We were told the internal doors were from Aranmore Primary School and the gorgeous leadlight front door from an old home in Shenton Park. My amazing patient husband painstakingly sanded back all the painted windows and doors in our living room back to original jarrah. 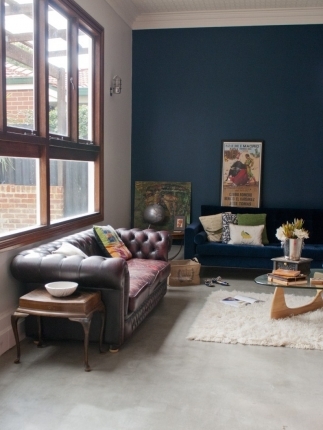 They look amazing.” Carla and Kevin painted the walls in Dulux Feather Dawn. Styling and photography: Meghan Plowman. NORTHERN LIGHT: The huge windows flood the north-facing living area with light and overlook the little pool. 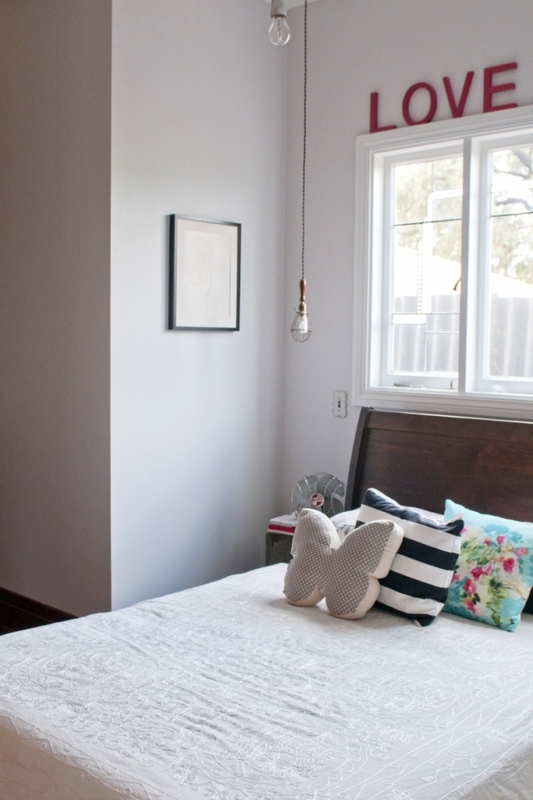 ABOVE RIGHT: In the bedroom, Carla used salvaged 100-year-old light switches. TEAMWORK: Carla painted the outdoor mural. Ben built the gazebo from pieces of jarrah from the old garage. The pavers are recycled. 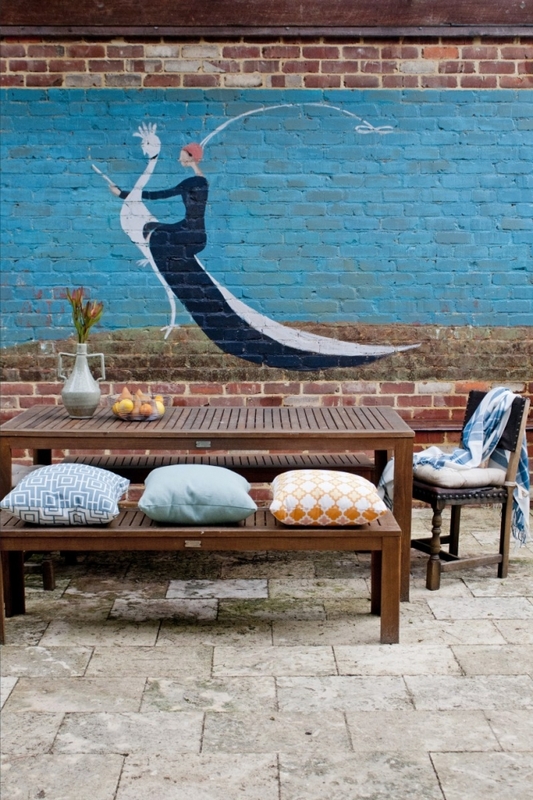 Cushions and vase from Ambassador De Buenos Aires in Leederville. 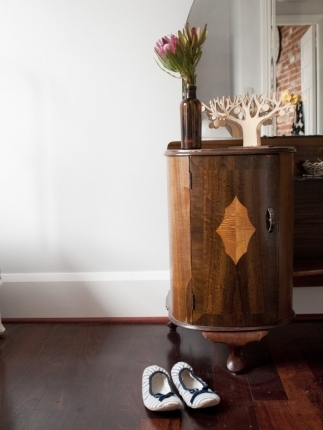 Styling and photo: Meghan Plowman. 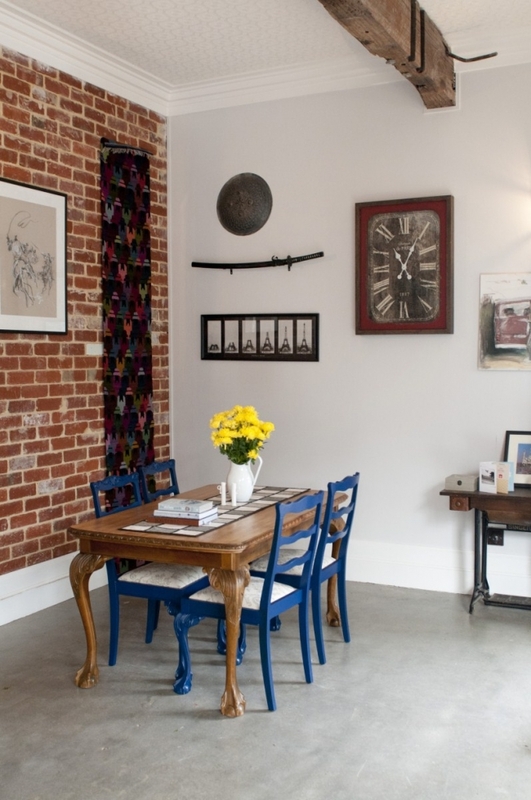 WAREHOUSE MEETS ART DECO: “We wanted an eclectic feel of industrial warehouse meets Art Deco shop, and with a long living space of 16m x 5m we wanted to subtly divide the space into living, dining and kitchen,” says Carla. “We found these columns at a salvage yard and really loved the teal colour and rustic yet playful nature that they possessed. 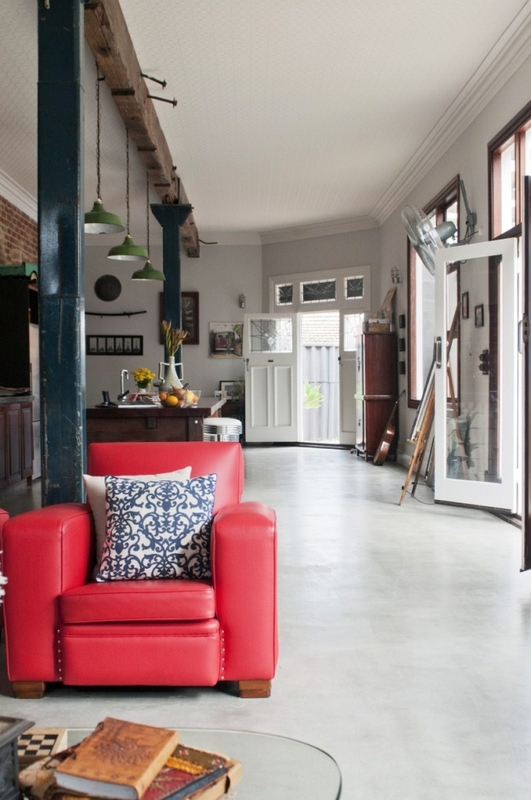 These were once in a vintage-era warehouse in Perth, so incorporating them into the design worked really well.” Styling and photography: Meghan Plowman. The old metal numbers above the front door were from salvage yards. And let’s not forget one of my favourite features of all – the upcycled wallpaper in the ensuite. But Carla is used to producing beautiful homes. She has a degree in architecture and postgraduate qualifications in Environmental Sustainability and started renovating houses at just 21. With her interest in sustainable building and design, it was a natural progression for her to start using recycled materials. 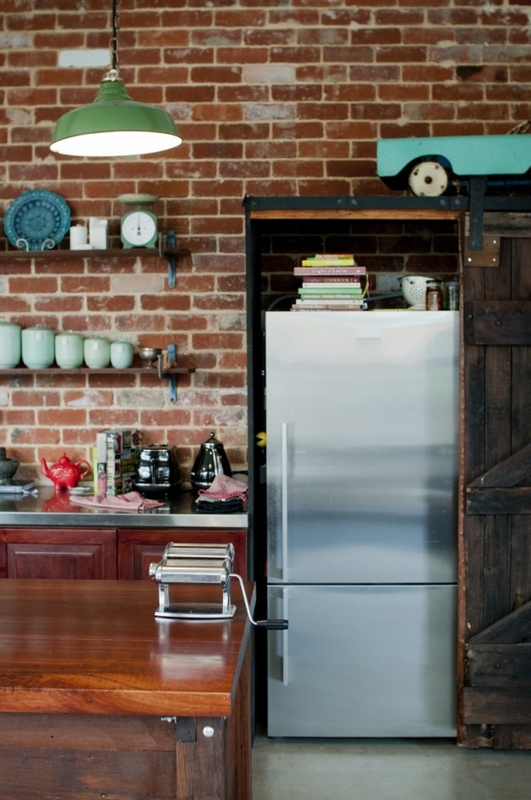 RUSTIC & RECYCLED: I LOVE the old barn-style door Carla and Ben upcycled for their pantry! Arrrgh. They recycled the door from the old 1940s shed and garage that they demolished to make way for the home. Carla and Ben also used the jarrah beams of the old garage as a structure for the central island bench in the kitchen, as well as for posts for the outdoor pergola. “We wanted this home to echo the sentiment from the original home and reference its past,” says Carla. The kitchen island has that lovely natural pull that has people gravitating around it when Carla and Ben entertain. “It works really well for entertaining and having people over,” says Carla of the home’s layout. Styling and photography: Meghan Plowman. CHALLENGES: A challenge was finding beams to sit on top of the warehouse columns – they had to be the correct size, as engineer specified, and of course recycled. “I stumbled across a timber yard; Carabooda Timber, and inquired as to whether they had anything suitable,” says Carla. “The result was these three exquisite beams originally from the Toodyay Bridge. We fell in love immediately, but knew they were a lot larger than what was specified. This involved additional engineer fees and a few headaches but we eventually got them up.” The wall colour is Dulux Feather Dawn. Styling and photography: Meghan Plowman. SALVAGED TILES: To offset the cost of the Spanish tiles and keep the budget down we used simple square wall tiles which were again sourced from a salvage yard.” The subtle grey tone with darker grout complements the antique floor tiles well. Styling and photography: Meghan Plowman. ABOVE LEFT: Old recycled doors from the open-plan living area open onto the gazebo, which Carla wants to grow wisteria over for summer shade. ABOVE RIGHT: Bedroom details. Styling and photography: Meghan Plowman. WALLS UP: The walls of the house took only one week to put up – they are eco-friendly Paneco, a Structural Insulated Panel System. Working extensively in urban design and architecture while designing residential projects on the side, she made the big jump earlier this year when she officially launched Etica Studio to fulfill her passion for this kind of home. When Carla told me about her business, I felt excited. I think there is a real demand for this kind of architecture and building in Perth – custom-built, small homes that are thoughtful, beautiful, sustainable, original, unique and full of rustic, quirky character and recycled materials. If I were building, this is exactly the sort of home I would want to create. Another bonus is the fact that the house is designed for an urban infill block (the site is just 320sqm). I think Etica Studio is going to be the next huge thing. PRESSED TIN LOVE: “The beautiful sheets of antique pressed tin were originally ceiling panels that were discovered at a salvage yard all twisted and warped,” says Carla. “The sheets with their crackled white paint, rust and exposed metal were irresistible, and reference both a sense of history and also, to us, the beauty of imperfection.” I think they look perfect where Carla has used them, as a kickback on the island bench. 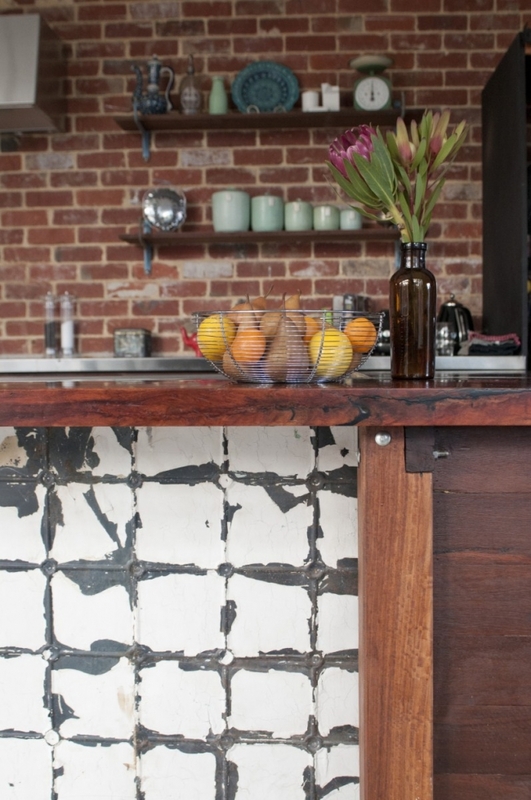 The patina of the tin contrasts with the warmth of the timber and the upcycled stainless steel bench tops, creating a beautiful balance of textures and an extra layer of visual character. “My father, a skilled carpenter, carefully chose the most regular sheets of tin and crafted these sheets into a seamless skin to the outer side of the island bench. This is my favourite element of the home,” says Carla. THE WORKBENCH-TURNED-VANITY: In the main bathroom, the vanity was made from the old, solid, handmade workbench that was in the old shed when Carla and Ben bought the house. The bathroom was painted in Dulux Klavier. Green enamel vase from Gingerhouse Homewares. Styling and photography: Meghan Plowman. A NATURAL HUB: The kitchen island has that lovely natural pull that has people gravitating around it when Carla and Ben entertain. “It works really well for entertaining and having people over,” says Carla of the home’s layout. 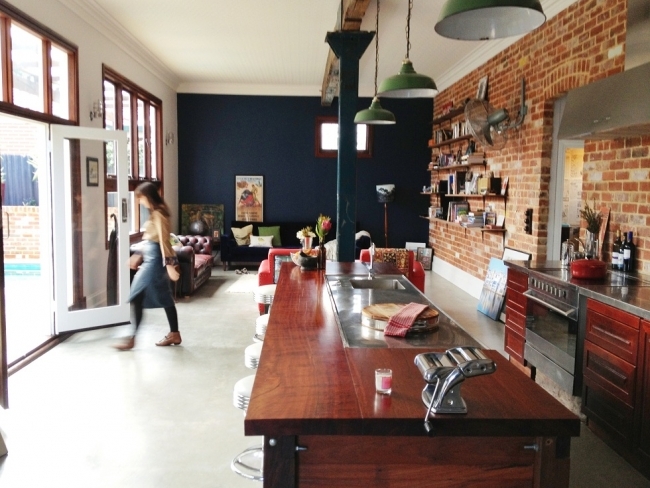 Recycled stainless steel benchtops provide wide expanses of worktop area. The one on the island was from an old restaurant kitchen. Being a sustainable home, Carla and Ben wanted all elements in the kitchen to be functional, with longevity and timelessness rather than succumbing to ever-changing trends. They decided upon a thick jarrah timber benchtop, which would beautify as it aged and became worn. It’s 3.5m long, offering plenty of space for cooking, and feels beautifully warm yet glamorous with a subtle matt sheen that reflects the light from the vintage pendants Carla and Ben picked up at a flea market in New York (for only $20 each, I might add!) Carla says the team at Carabooda Timber crafted the benchtop from a slab of locally sourced timber and come highly recommended by Carla! Styling and photography: Meghan Plowman. 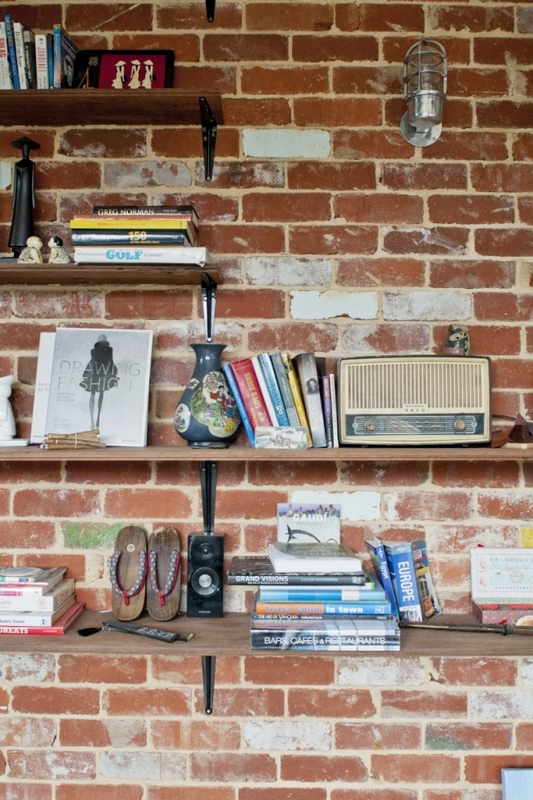 "Left over recycled floorboards from our bedroom floors were joined together and utilised as simple cost-effective shelving, placed above the cast iron brackets," says Carla. "As collectors of vintage pieces from our travels this shelving provides us with additional area in which to display these pieces to give an honest and casual look to the kitchen." Styling and photography: Meghan Plowman. 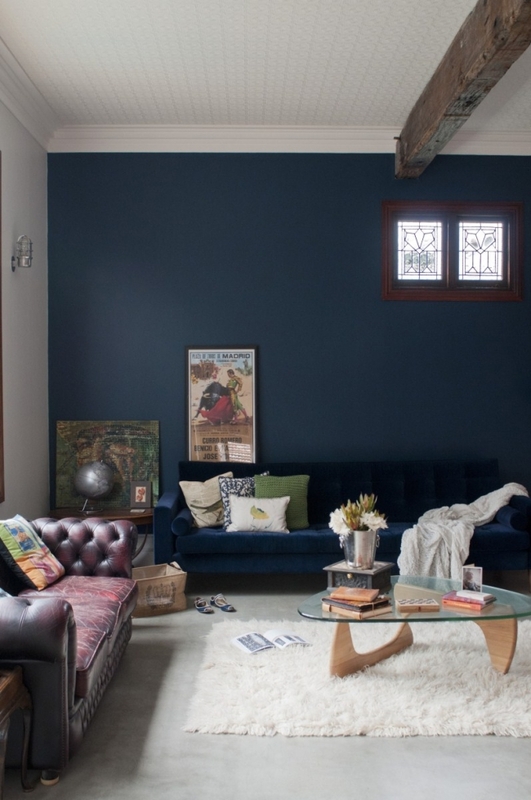 NAVY LOVE: Carla and Ben had the beautiful velvet-covered couch custom-made for them by Ambassador de Buenos Aires in Leederville (who I wrote about once here!) "We wanted an extra-long couch and we know we will keep it forever," says Carla. "We love it." The wall colour is Dulux Integrity. Styling and photography: Meghan Plowman. The pantry door, originally part of the garage. Almost every part of the house is a recycled material – the windows, doors, floorboards, structural columns, ceiling beams, kitchen cabinetry, bathroom vanities, sinks, skirting boards, light fittings, Spanish floor tiles, basins, paving. The walls are Paneco SIPS. The house has three bedrooms, two bathrooms (one ensuite) an open-plan kitchen, living and dining, pool, patio, a grey water system, heat pump, solar hot water system and rainwater tanks. I LOVE THIS!! 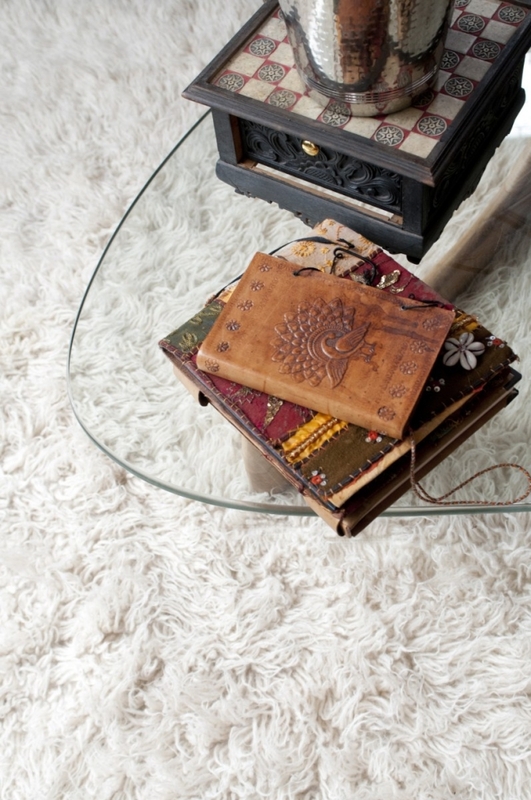 Eclectic, warm, unusual, and most importantly of all, recycled! Carla looks like she is headed straight fro the top. I think so too Amy! Beautiful feature once again. We LOVE that powder blue sink especially. Me too!! That was one of my favourite bits.... just divine. This is amazing! I had no idea that people could actually do this and it's something I've been dreaming of for ages! That vanity from the old bench is the most gorgeous thing ever, and the lights above the island bench. Although my girlfriend wants and uber-modern house when we build, I think I'm going to have to come to Etica Studio and convince her otherwise! I know how good is it??! I'm always amazed by people who can build using bits of recycled and salvaged things, I never understand how they know how to make everything fit so perfectly and look so good. I think you guys should most definitely pay Carla a visit! Maybe she can act as a 'building mediator' between you and your girlfriend and help you strike a happy balance between recycled and modern! 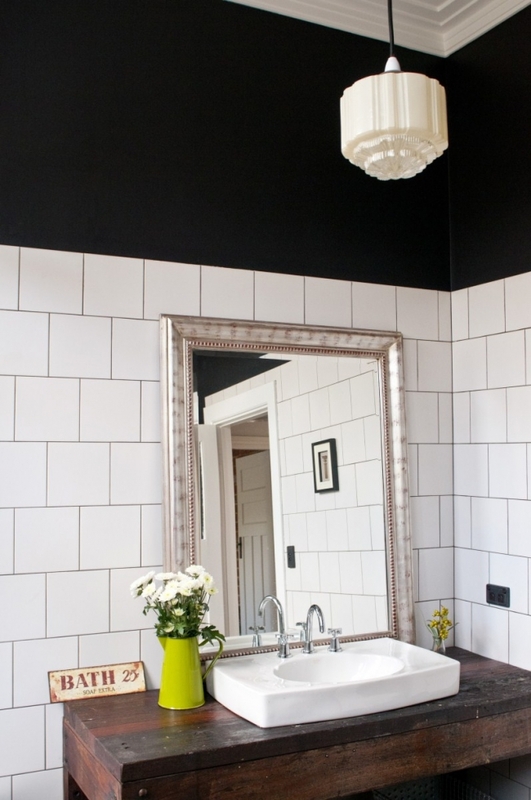 Like crisp, plain white walls in a modern bathroom with a vintage sink? Or a clean-lined, contemporary white kitchen with an antique light fitting and vintage encaustic tile splashback? Best of both worlds! My partner and I argue regularly when it comes to home and interior things so I know what it's like trying to find that happy compromise! Wow what an amazing home....well done Carla and Ben very impressive!!! I LOVE it!! Me too!! Seriously got jealous here. We are in awe of our daughter Carla and son in law Ben for their imagination and commitment to bring this beautiful "dream" to life. It is an amazing achievement. Simply stunning!! Very very talented daughter and son-in-law you have Karen! All the persistence and hard work certainly paid off. I think it's one of the most beautiful homes I have seen. Maya, you rock. And Megan. And Carla. Amazeballs. Crushing on this in a big, big way. ethically, this house is strong enough im sure, to sway many modern loving builder/designers to consider using salvaged beauties...something i believe we should all strive to do as much as possible. i love that family and their skills were embraced to add a very personal touch . on a design front, i absolutely love that carla and ben have not succumbed to what i feel design has fallen to in so many homes...commercialism. instead, this house feels true to the owners interests and loves. it shows gorgeous individualism...something i admire strongly...particularly the outdoor mural - amazing! So true!! It has individualism and character and such a wonderful feeling of warmth. The kind of house you pop into and want to linger in for hours, it feels so homey. I also love that they upcycled so many pieces of it... I also think it is something we should strive to do more of, especially when so many features of old houses just end up in landfill. By the way I think Carla did the mural based on a drawing in a vintage fashion magazine... so lovely! Just wow. I live in a nearby suburb in an old 1940s cottage we are slowly trying to bring back to life. 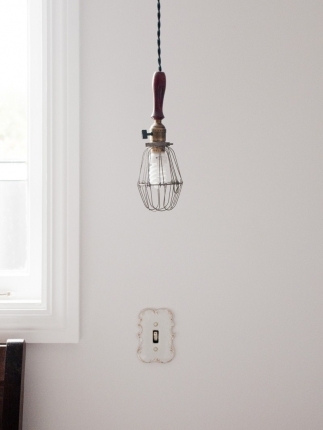 So many elements Carla has used are ones I would love to bring back into our house. Carla you have inspired me to do the right thing by our little old house! Maybe one day if we build a new place (I am the same as you Maya - committed to old houses) I will have to give Carla a call. Is there any way of finding out paint colours from Carla? Hi Lesley - paint colours from Carla as follows: Bathroom: Dulux Klavier, Living and Bedrooms: Dulux Feather Dawn, blue feature wall in living: Dulux Integrity. Thanks Maya you are a legend! Oh my! This is so gorgeous. I seriously hope that I'm one of those people who can say they have tiles from Spain and treasures from flea markets across the globe in my home! What a beautiful, stunning, inspiring home! Carla and Ben are so talented! I love their ethical and aesthetical vision. I hope we see more and more of this type of building in the very close future. I dislike with passion those generic, grey, ridiculously-large house-on-a-ridiculously-small-block, must-have-perfectly-straight-walls-and-all-simiar-doors-and-windows new buildings... It reminds me of the movie "Gattaca". Striving for a cold, clinical, oh-so-perfect home now; expecting the same from the humans living in it in the next few years? Yay to individuality, yay to character, and yay to sustainability! Thank you Melinda! So happy to hear that you like the blog and to 'meet' another reader :) I hope you do start a renovating design blog, I would love to read about your renovation. I can never get enough of design blogs - I need my daily fix! Completely agree with you that Perth needs more houses like this - Carla's place is perfection to me. You draft these kinds of houses every day, I have to write about these kinds of houses every day (for my job as a freelance journalist). So when you come across something like this - yep it definitely leaves a lasting impression! Hi, Im in love with Carla and Ben's house!!! I also try to use recycling materials at my old cottage house, everyone should! this house has definitely inspire me!! Is there any way of finding out the brand of that marvelous bathroom basin? it really suits the workbench vanity! Crazy job! Many Thanks. Thank you very much!! I appreciate it! What a fantastic house! Do you know how the floors were done? Do you think Carla and Ben would allow a photoshoot in their beautiful home? Where can I find those bathroom tiles?!?! Obsessed! I LOVE the bathroom design with the claw foot tub surrounded by tile. I have designed my own bathroom with the same layout. I have however run into a problem. How do you seal the tub and wall for taking a shower? My design has tile on two sides and then I planned to use an L shaped shower curtain on the other two. But my builder just told me because of the rounded lip on claw foot tubs even a bead of silicon won't work because the edge is going to hold water not direct it back into the tub. How did you solve this problem. I really want to avoid an ugly 360 shower curtain. If you have any suggestions please let me know. And just to say it again BEAUTIFUL design!!!! Hello, This home is beautiful! I was wondering if I could get into contact with the owners and discuss the possibility of shooting my label in their home? What a stunning house this is, I am in love with its diversity, colours and tiny detailing. It looks so special without being too much to the eye - the perfect balance. Definitely drawing inspiration from this one, hope we'll see more like it in the future.